The buzz word in education today is accountability. But the federal mandate of "no child left behind" has come to mean curriculums driven by preparation for standardized tests and quantifiable learning results. Even for very young children, unstructured creative time in the classroom is waning as teachers and administrators are under growing pressures to measure school readiness through rote learning and increased homework. 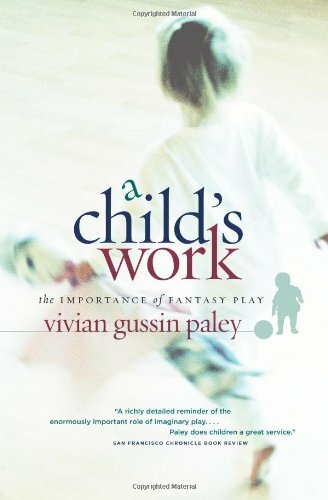 In her new book, Vivian Gussin Paley decries this rapid disappearance of creative time and makes the case for the critical role of fantasy play in the psychological, intellectual, and social development of young children. A Child's Work goes inside classrooms around the globe to explore the stunningly original language of children in their role-playing and storytelling. Drawing from their own words, Paley examines how this natural mode of learning allows children to construct meaning in their worlds, meaning that carries through into their adult lives. Proof that play is the work of children, this compelling and enchanting book will inspire and instruct teachers and parents as well as point to a fundamental misdirection in today's educational programs and strategies.